Washington (Sep. 8) — Pew Research Center and Andy Kohut’s former colleagues are sad to announce that Andy died early this morning. 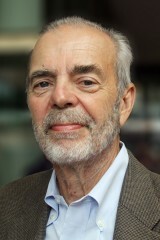 Andrew Kohut was the founding director of Pew Research Center. He served as the center’s president from 2004 until he stepped down in 2012, and directed the Pew Research Center for the People & the Press from 1993 to 2012. He was president of The Gallup Organization from 1979 to 1989. In 1989, he founded Princeton Survey Research Associates, an attitude and opinion research firm specializing in media, politics, and public policy studies. He served as founding director of surveys for the Times Mirror Center 1990-1992, and was named its director in 1993. He was a past president of the American Association for Public Opinion Research and the National Council on Public Polls. In 2005, he received the American Association for Public Opinion Research’s highest honor, the Award for Exceptionally Distinguished Achievement. He was a frequent commentator on public opinion for National Public Radio, the PBS NewsHour and other news media outlets. He had written widely about public opinion for leading newspapers and magazines, as well as for scholarly journals. He was the co-author of four books, including, most recently, America Against the World.